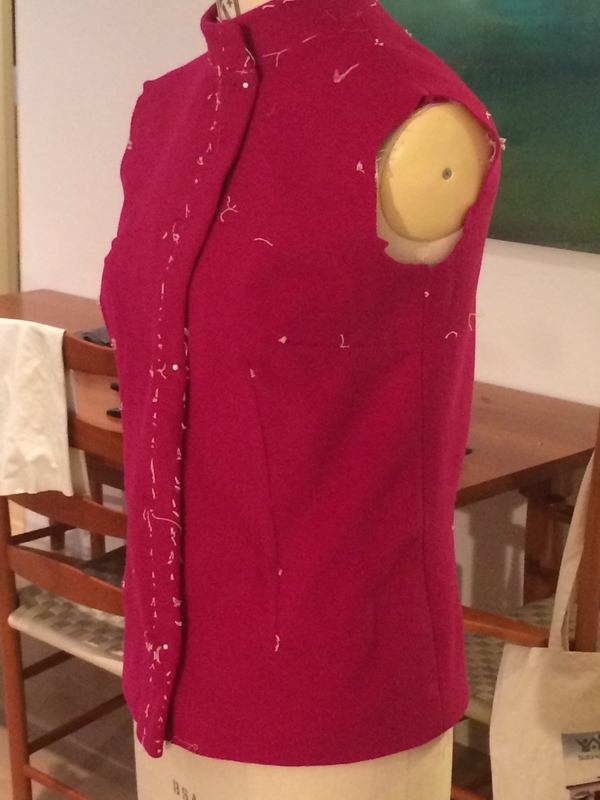 According to my Sewing with a Plan project plan the fuchsia jacket should have been completed this weekend. I started two weeks ago and it should have been finished by now. But I don’t think I can go out like this. No sleeves, pockets, buttons or lining. And those tacks look, well, a bit strange. What do you think? I have fallen behind due to being very busy at work. It has been a tough week putting together a great bid for a new town centre development, and preparing to present it effectively. 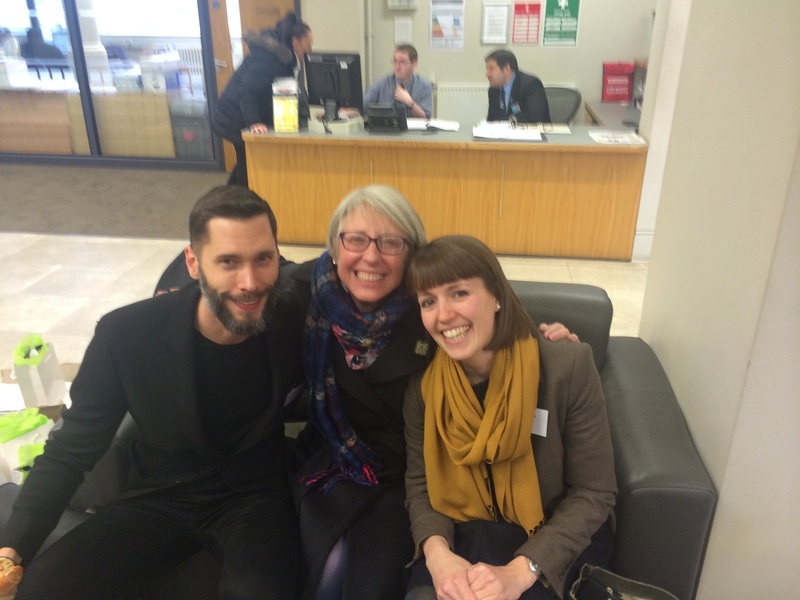 Here are two of the amazing architects I have been working with – Scott and Rachel. I have been carrying a lot of stress when a jacket like this needs a relaxed seamstress without too many demands on her time. But these are excuses. The real reason for my slow progress has been my ability to make mistakes that I avoided the first time I made this jacket. The first problem was that I managed to prepare two left fronts. I only discovered when I kept looking for the right side in order to put in the button-holes. “Well that is the left front, the other one must be the right”. It is surprisingly easy to make this elementary error especially when the face and back of your fabric is very similar and your eyesight is a bit duff. Annoying, but not the end of the world. I unpicked the interfacing and darts, pressed the fabric gently, and repeated all the processes on the correct side of the cloth. Then I made the bound button holes – a process I really enjoy. My second problem was more challenging. I created a grown-on facing, but this caused a problem I cannot, at this moment, fathom out. Somehow the facings, including the back neck facing, were something like 4 inches too short. And again, stupidly, I only discovered this once I had basted and permanently attached the inner collar to the facing, and found it didn’t fit. Not just attached but also trimmed closely to the seams. I found this error totally depressing. When I unpicked the facings, recut the right size, reattached them, and then sewed the collar it all actually went well. But I had dreaded it and procrastinated for four or five days. It needed concentration and a high degree of accuracy and I couldn’t bring myself to actually do it, taking the risk of making a complete and irreversible mess of it. The simple change to a facing treatment risked the whole finish of the collar – probably one of the most important aspects of the construction in terms of how professional it looks. In the end, by giving it two or three hours of quality, relaxed attention on a Friday night, I am satisfied with the outcome. I am still behind schedule but I am now on the home straight. the lining (choosing the right colour and inserting it accurately). I have no worries about the sleeves, hems and buttons, although I don’t have any yet. I had planned to have the matching skirt ready next weekend, so I need to get a move on. I haven’t even chosen a skirt pattern yet, but it will probably be a vintage (1960s) one I have made before, a “TNT” pattern. I have three weeks “float time” in my project plan. It looks like I have blown one of them already. Let’s see if I can catch up without making a major error. I never sew well under pressure, although I know some people thrive on it. If I have a bunch of projects waiting, even if there is no deadline, I have to rush at it until I am down to only one or two and errors and sloppy sewing occur. That is why I SWOP – sew without a plan. Good luck with the bid. Oh Dear my heart went out to you when I read this. Firstly everyone I know has cut two sides the same they just don’t tell anyone. You are doing this for enjoyment, so relax and enjoy it. While it is admirable to strive for perfection it is not good to beat yourself up if you feel you have not achieved it. What I do when I am in a situation like yours is I put the garment on the side for a short time and get on with the next one. When you go back to it you will see it with fresh eyes and the solutions are quickly carried out. Your new work project sounds very interesting. Its well on the way now. I don’t know why, but tailored garments, the ones where one tries so hard to be accurate, often seem to get a serious blip on the way. You are a phenomenal lady (and so generous with your thoughtful comments on others’ work, too), K. I don’t know how you do so much! I definitely don’t do anything perfectly when I am under general pressure and I am far less productive than you are. The jacket looks great at this stage, so great that you resolved the issues. Good luck with the development project! You make me blush. You output is phenomenal. You sew, skate, knit, speak languages, enjoy music, art and reading, conduct a transatlantic relationship, run marathons and write a lovely blog. I don’t know where I picked this tip up from but it saves SO much wasted time later. When dealing with a fabric that late at night, in poor light, under stress and with 50 something eyes looks the same both sides make sure you look at it in day light, determine which side you think is right and then scribble all over the wrong side with chalk. It has saved my nerves and a project on so many occasions. Amazing how you “Do It All”! Thank you Jane. I love it when commentators provide such great tips. have used chalk too. The tradition I was taught was to use X for back! But I usually go by the tailors tacks, with the messy side as wrong side. I was just thinking about something else at the time. Thank you so much for your encouragement. Now it is finished now, thank goodness, and I actually like it alot. I am so looking forward to seeing your jacket – personally I love wearing them and find the time and effort well worth it.